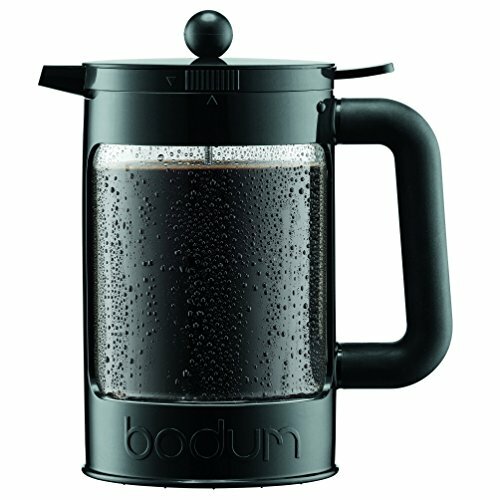 The French press Coffee system is what Bodum is most known for. We've produced millions of presses; we've added more designs, more sizes, more features like double wall glass and a lid that closes completely between pours. As far as we were concerned, we knew everything there was to know about the French press. So imagine our surprise when a customer tells us they've discovered the best way to make ice Coffee with a French press. We've tried it their way and we have to agree - it's fabulous. And simple - which fits our philosophy perfectly. So here's how it goes: first you put the ground Coffee in the jug as usual. Then you add cold water and put the jug in the fridge overnight. In the morning you press down the plunger - et voila - you have the most smooth tasting ice Coffee you can imagine. Enjoy it Black or with milk and let yourself be surprised. The bean comes with two lids: one for the fridge overnight and one with a plunger to press down the Coffee grounds in the morning. The 1.5 L bean ice Coffee maker is made from plastic, silicone and stainless steel.